When I was in Houston, Texas back in April for my great grandmother’s funeral, after my family had eaten lunch together in one of the many Vietnamese neighbourhoods surrounding the city, my siblings and I made our way into a gift shop that sold primarily Buddhist statues. I had only a very small two inch pewter statue of a seated Shakyamuni Buddha at the moment, so I decided at that moment it was a perfect time to make a new purchase. Not a standard buddha, no, whether Shakyamuni, Amitabha, or Vairocana. Browsing shelf after shelf of gorgeous golden statues, face after face of serene smiles, I felt a strong need for my altar space to include a bodhisattva. And help to dispel the misery of the world. My eye snagged on a very particular statue, a throned being of golden skin, eight arms and four faces. He reminded me of the depictions of Avalokitesvara Bodhisattva when in thousand-armed form. I assumed it was a depiction of him, but it didn’t matter at all who this being was. I knew this was the one. I purchased him. I hadn’t noticed until afterward that these being held a six-spoked wheel. The Wheel of Dharma has eight spokes, representing the Noble Eight-Fold Path. And then I later learned that this was a Cambodian depiction of Brahma. Why, I wondered, had there been a Hindu statue among all these Buddhist ones? 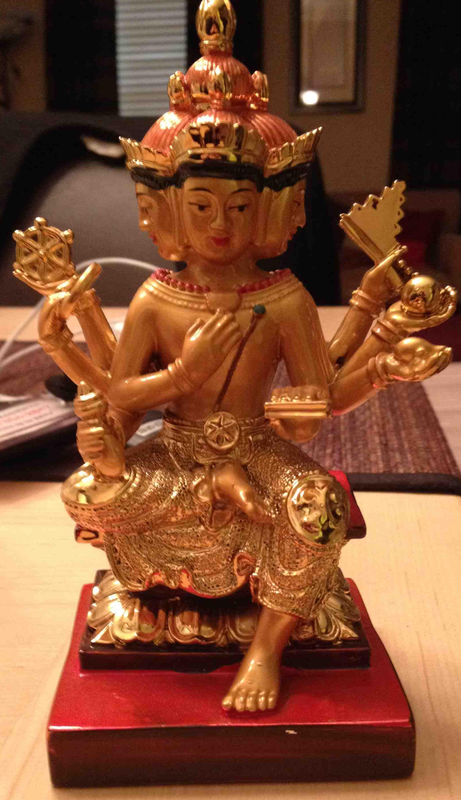 Brahma, of course, exists in Buddhism and is a prominent figure in the lore. It is used as a title and often specifically refers to Mahabrahma, the deva who is first in the cycle of universal expansion to be born into the Arupadhatu (Formless Realm), after having died in a higher realm. As with all rebirths, knowledge of previous lives has extinguished. Being alone, Brahma comes to believe he is the only being in the universe. He starts to feel lonely and wish for company. Eventually, other beings die and are reborn into his realm, or lower realms that he can observe. This causes him to believe that he created these beings; and these beings, having no other reference, believe his claim that he is the Creator. But that still doesn’t explain why Brahma would be a deva of veneration in Buddhism, does it? To understand this, I had to go back and read some of the texts of Gautama’s enlightenment specifically. In all of these tellings, Gautama post-enlightenment is very hesitant to teach others the path. He doesn’t believe that he can, or if it’s worth his effort to try. According to lore, a being manifests before him, from a Formless Realm, and convinces him to teach. This being is always described as an anagami (non-returner) who trained under Gautama Buddha’s predecessor, Kasyapa Buddha. The anagami made tremendous progress under that particular buddha, yet did not attain arhantship (“arhant” is the conventional title for non-supreme buddhas). He attained the fruit of the non-returner (no more births in the Sense Domain, but one more birth overall) and resided in the Formless Realm for millenia in order to complete his training. In some tellings of this story–and I believe this actually exists in the commentaries, not in the actual scriptures (the first few centuries of commentary are considered canonical)–the anagami in question was also the current Brahma of that time. His name is Sahampati, but is often simply referred to as Brahma in the texts. After much of this reading, I began to pay closer attention to references to Brahma in the texts, such as in the Mahaparinibanna Sutta from the Nikayas, where Brahma grieves over the Tathagata’s passing into final extinction. Brahma routinely displays great reverence for the Tathagata throughout the texts, and the two appear very friendly in some respects. Unfortunately, I still don’t have a bodhisattva anywhere in my home, but my practice of Mahayana Buddhism is a little unique compared to other traditions, I think. In the Thien, Zen, and Chan traditions (I will use “Zen” from now on, since it’s the most familiar), there are arguably three set of texts that are given primary emphasis: the Lankavatara Sutra, the Mahaprajnaparamita Sutras, and the various sutras on Tathagatagarbha (“Buddha-nature”). Some of the emphasized concepts in these texts are at-odds with one another. The Lankavatara Sutra is probably dearest to me. It represents an ontological framework called yogacara, often described as “Mind-only.” I may write on that later, but this is becoming a fairly hefty post already. What is important about the Lanka text and particularly about the yogacara school of thought (which we should consider a proto-Zen sort of scholarship) is that–despite being a Mahayana text–it very closely resembles and emphasizes the gradual training system presented in the Theravadin Nikayas. Zen traditions themselves de-emphasize gradual training over sudden insight and awakening. Meditation and progressive training facilitates the sudden arising of insight–this statement is true of all schools, both Theravadin and Mahayanist–but yogacarin thought is unique in Mahayana in that it doesn’t claim that every single being will be a supreme buddha. In some ways, this idea directly contradicts the fundamental Zen concept of Buddha-nature, which infers that arhants will go on to take the bodhisattva vows. So the path in yogacara–now a tremendously rare tradition to come across–is somewhere in-between Mahayana as we know it today and Theravada. There is a training system that very closely resembles the path outlined in the Nikayas: there is training in samatha, measured by attainments and perfections of the dhyanas, which develops the capacity for calm-abiding. In Theravadin practice, the jhanas (for those who practice them) is used in conjunction with vipassana, or mindfulness meditation (though many Theravadins, particularly in modern practice, train exclusively in mindfulness/insight). For the yogacarin and Zen practitioners, mindfulness (training to view reality as it is) is the practice of developing prajna (wisdom) by recognizing sunyata (emptiness). Zen uses a specific technique (contemplation of non-dualistic koans) while the yogacarin contemplation is a little more general, can include koans, but can also include any other meditative techniques that bring awareness to emptiness and inter-dependence. The dhyanas are requisite here, as insight can only be attained when the mind has been trained in preparation for it. So you see that the path is not very different between these particular Mahayana and Theravada traditions. Now, back to Brahma. As a lay-person, I have no desire to put my practice toward what might be an unrealistic goal. What I can do is undergo rigorous training and hope for an even more fortunate birth where I might be able to dedicate more of myself to the goal of enlightenment–whichever enlightenment that is reasonable to attain. I had intended to purchase a statue of a bodhisattva, but I feel I came away–quite unintentionally–with something much greater and meaningful to me. Here is Brahma, representing a being who has yet to attain enlightenment, but has undergone such rigorous training as to attain the fruit of the anagami. What better symbol to represent the practice of a lay follower than an anagami? A bodhisattva has already relinquished all attachment and conceit, particularly the conceit of “I am.” While the anagami has been released from attachment to self, there remains a residue of the “I am” conceit. I like this idea better: understanding what is the last remaining residue one needs to be liberated from and putting forth the discipline, faith and practice necessary to do it. Even if it takes millenia. Even if, residing there in the Formless Realm, you watch Tathagatas come and go. Should it take ten thousand births or more. This entry was posted in Buddhism and tagged anagami, brahma, buddhism, chan, dharma, mahayana, religion, sutra, theravada, thien, yogacara, zen on June 15, 2014 by antranwritesstuff.